A two-thirds majority of citizens (66 %) believe that tensions between Czechs and foreigners are very or relatively high. This proportion is the same as last year. A three-fifths majority of citizens perceive tensions between company management and employees (59%). 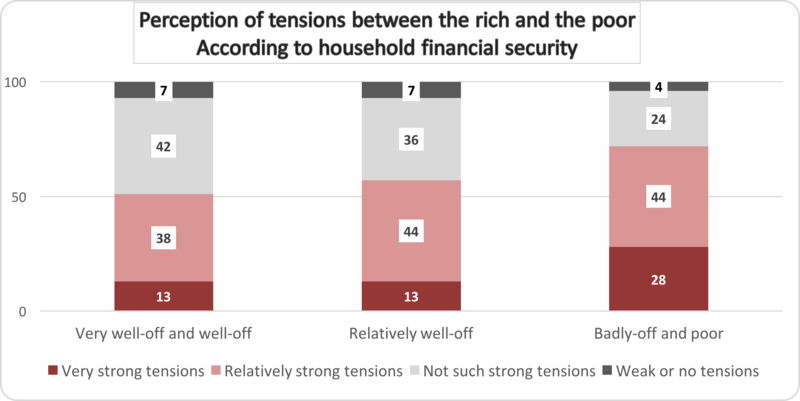 A slightly lower percentage of people (57%) believe that tensions are high between the rich and the poor. Since 2011, when STEM began to monitor this area, the proportion of those who perceive tensions between the rich and the poor to be high has been gradually declining. However, this proportion is still high among those living in worse-off households. Slightly over half the population (56 %) perceives strong tensions among people of different political views. People less frequently perceive tensions between young and elderly people (39 %) and, even less so, between city and rural dwellers (29 %). This survey was conducted by the STEM non-profit institute (www.stem.cz) on a representative sample of the Czech population aged 18 and over from 27 February to 6 March 2017. Respondents were selected using a quota sampling method, with some 1,042 people taking part in the survey. The existence of conflicts and tensions between social groups is inherent in society and is a prerequisite for its development. In certain periods and situations such tensions can escalate and lead to conflict. When such a situation arises, the catalyst can be economic or political change in society, but it can also be some development on a wider, European scale. Therefore, in the March 2016 survey, it was evident to us that Czech citizens were more sensitive than before to tensions between Czechs and foreigners in this country. The present survey reaffirms these findings. In March 2016, 67% of citizens considered tensions between Czechs and foreigners in this country to be high; a year later the figure still stood at 66%. Therefore, there has been no shift in perception and in terms of attitudes and the Czech public continues to have some concerns as a result of the refugee crisis and terrorist attacks in European cities. An approximately three-fifths majority of citizens also perceive tensions in the socio-economic and socio- professional spheres – on one hand, among company management and employees (59 %), on the other, between rich and poor (57 %). Nonetheless, while the findings in relation to tensions between management and staff have remained relatively stable in STEM surveys (with the exception of 2011), there has been a gradual decline in the proportion of people who perceive strong tensions between the rich and the poor. Slightly over half the population perceives strong conflicts between people of different political opinions (56 %). Citizens believe somewhat less frequently that there are strong conflicts between the young and old (39 %) and – of the options given – they least frequently perceive conflict between city and rural dwellers (29 %). Note: The 2011 survey did not include the public’s views on conflict between Czechs and foreigners. Let us take a closer look at the findings as they relate to tensions between the rich and the poor. As noted above, we have seen a decrease in the proportion of those who consider these tensions to be high. 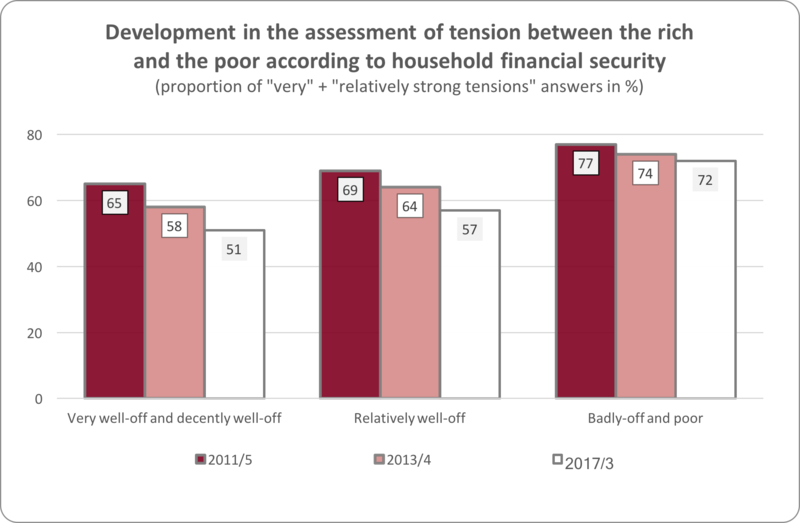 The more negative respondents’ subjective assessment of their own household financial situation, the more likely they were to perceive conflicts between rich and poor. A clear majority of those who perceive tensions between rich and poor to be high are people who consider their households to be badly-off or poor. The situation is ambiguous among those on average incomes and among the better off, with about half of them admitting to tensions. Some of this group, however, does not consider these tensions to be significant. The development of attitudes in relation to this issue is interesting. A decline in the perception of tensions can be observed primarily in the case of better-off respondents. The proportion of those who consider there to be tensions between the rich and the poor remains high among those who assess their own situation to be bad. If we take the block of questions dealing with tensions between different groups as a whole, it is possible to create a single variable – an index that will reflect overall public attitudes towards this issue. The higher the index, the greater the proportion of people who describe tensions between the different groups to be very or fairly strong. 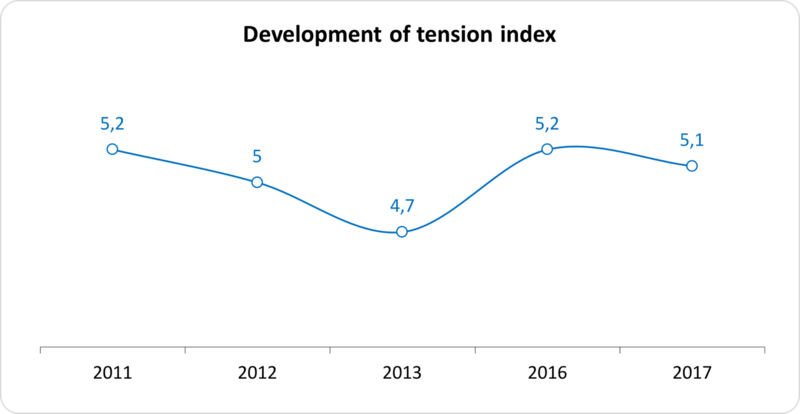 An overview of the development of the index shows a decline in the perception of tensions in society from 2011 to 2013. In 2016 and 2017, the index increased again, primarily due to greater sensitivity among citizens to tensions between Czechs and foreigners. Differences in index values ​​in different socio-demographic groups primarily indicate a difference in attitudes amongst university graduates. This group’s index value is significantly lower (4.6) than for other groups. The same is true for young people under the age of 30 who also deviate in their perception from those in other age groups (with an index value of 4.9). Nonetheless, we found even greater differences in relation to respondents’ subjective perception of their household financial security. 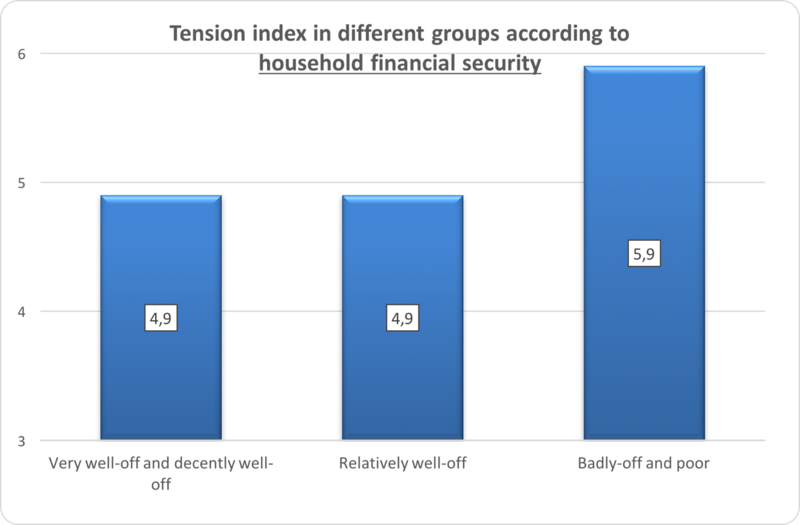 Those who consider their households to be worse-off perceive tensions in society to be more serious (5.9). Similarly, the tension index presents a profile of citizens based on how they categorise themselves into the various social strata: people who fall into lower middle or lower strata of society are more sensitive in terms of their perception of tensions between the groups (5.6). In conclusion, another interesting finding is that people who follow the news and current affairs primarily on television more often consider tensions in society to be high (5.4) as against people who get their information mainly from the radio or print media (4.8) or those who read the news on the internet or Facebook (4.8).